Guess what farmer! Dad just took Mama out for the day so we could decorate the new baby’s room! It’s my big surprise for Mama. We don’t have much time so we gotta hurry! 1. Ellie made these adorable curtains for the baby’s room. Got pictures of lil’ animals on ’em, even lil’ bunnies munchin’ on carrots. How perfectly perfect for farm-life! 2. Granny’s makin’ a baby quilt. In fact she’s just finishing the last few quilt squares before stitching it together. I can’t wait to see it; gonna be so totes adorbs! 3. Oh my gosh, speaking of the baby quilt, here it is now! Aw…and look at the squares; happy lil’ cherries, pretty horses, chubby chickens and baby owls. AWESOME! 4. Yay! Yay! Yay! Everything’s looking so GREAT farmer! Now, while William and Darryl build the baby crib let’s spruce the place up with some flowers…mama LOVES flowers! 5. OH NO farmer! Mom and Dad are back already!? Quick, we still have a few things to do. I know! If you can finish the gift baskets, I’ll try and stall mom at the door! 6. Dang! Mama totally knew I was hiding something. OH NO! She’s headed for the baby’s room…Hurry farmer, Felicia too. Grab your gifts and get into position to yell surprise. 8. Woops, uh-oh! Maybe we surprised MAMA a lil’ TOO much. Seems like she’s having labor pains?! YIKES! Time to pack the hospital bag, Dad’s gotta take her to the hospital STAT! The new Babyroom surprise mission is a real RC eater. The quilt square machine is 7RC on sale. The begonia flower is 3RC to open up and the Vicugna Habitat is 8RC on sale. 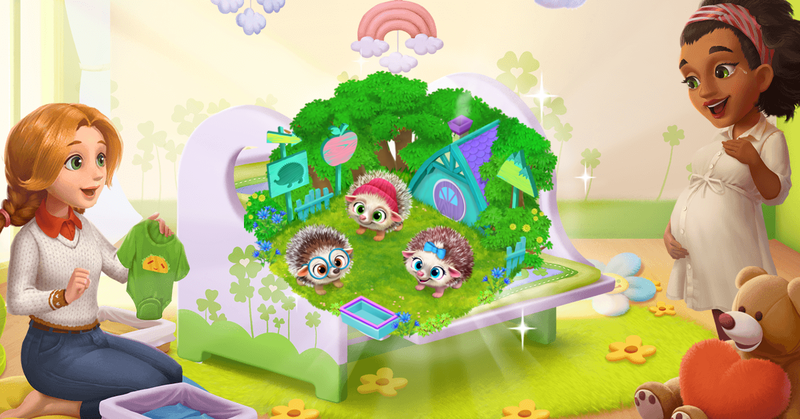 The prize is a hoglet habitat which is a new animal. Page generation time 0.0479 sek.